Strata Sequence is a body of work comprising a range of creative outputs, including compositions and installations. The work represents a series of collaborations with museums and festivals related by the theme of geology. The first created work, Living Waves, is a multi-channel composition interweaving field recordings from the Lake District with readings from the writings of John Ruskin alongside recordings of a specially created lithophone (the Brantwood Musical Stones) played by Dame Evelyn Glennie. An interactive audio-visual installation, Strata, was subsequently created utilizing the Xbox Kinect sensor with custom software created in MAX. This allows participants to play a virtual version of the Brantwood Musical Stones via hand movements in front of a video screen, and is designed for touring. 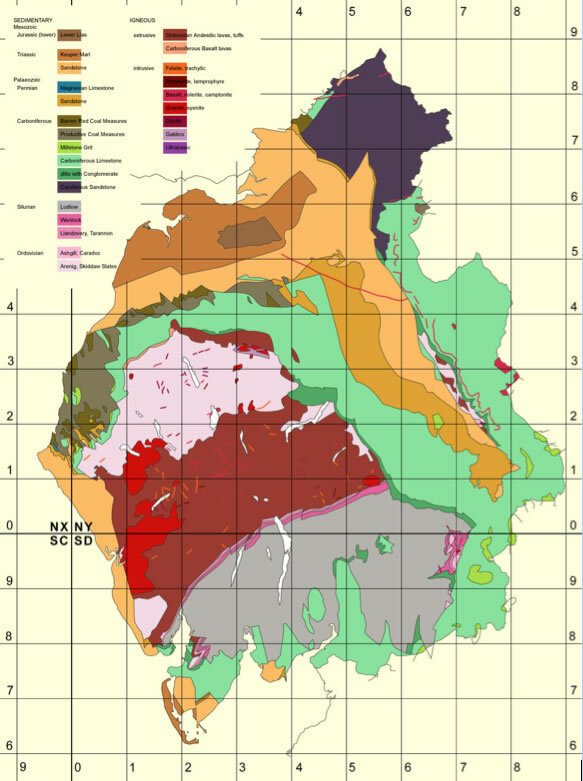 An on-line geological soundmap of Cumbria is also being created to represent sounds above and below the ground. The final part of the sequence is the recreation of a Jurassic soundscape entitled Re-imagining the Jurassic. This was created for a 16 month exhibition at Scarborough’s Rotunda Museum called Scarborough’s Lost Dinosaurs. The multi-channel (5.1) fixed-media composition Living Waves was commissioned for the interdisciplinary Ruskin Rocks Project  led by Leeds University, and funded through Natural England. The project brought together musicians, artists and scientists to create two new 21st Century lithophones (the Brantwood Musical Stones ). These stone percussion instruments are housed at Brantwood: a museum situated by Lake Coniston in Cumbria and the former home of artist, naturalist and social commentator John Ruskin. The two lithophones have been created from ringing rock extracted from several Cumbrian Quarries. The commission arose out of previous work I conducted with ringing rocks in the piece Song of Stones , composed in the studios of La Muse en Circuit in Paris. This piece maps a geological cross-section from the West coast to the East coast of Britain, combining recordings of lithophones made from rocks at four locations along the route with associated field recordings and voice. It includes the Richardson lithophone, housed at Keswick Museum and Art Gallery, made using hornfels from Skiddaw. This formed the first point of contact with Cumbrian ringing rocks and led to the subsequent Ruskin Rocks commission. Living Waves  has been inspired by the thoughts, writings and paintings of Ruskin. It is the sub-title he himself gave to Deucalion  , his book on geology. 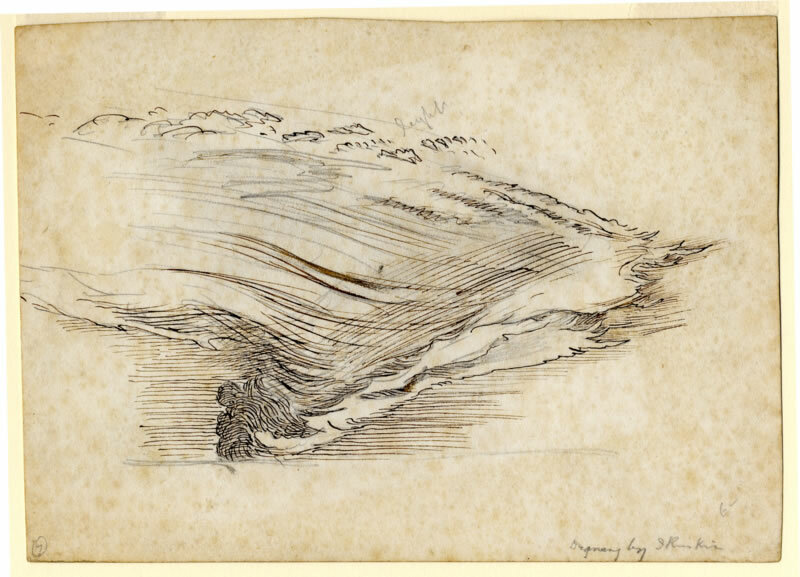 It is also included in the name of the exhibition ‘Living Waves: Form and Rhythm in the Art of John Ruskin’, shown during 2010 at Brantwood, of some of his drawings and watercolours in which he explored the many repeated patterns which occur in nature. Mountains are viewed as fluid and dynamic forms, living waves created by the shifting of the earth’s crust. On a conceptual level, Ruskin identified with the medieval scholars’ concept of Musica Mundana, or ‘music of the spheres’, a celestial harmony. The three branches of the medieval concept of music were laid down by Boethius as Musica Mundana, Musica Humana (the internal music of the human body), and Musica Instrumentalis (sounds made by singers and instrumentalists). This sense of inter-connectedness pervades much of his work. Through the compositional process I have tried to mirror Ruskin’s visual explorations from a sonic perspective, using a range of transformational techniques to convey repeated patterns and rhythm in different soundscapes at both the micro and macro level. In the context of this piece I have also interpreted the three medieval divisions of music interpreted as: sounds naturally occurring in nature (Musica Mundana); speech and the sound of manmade machinery (Musica Humana); and instrumental sounds (Musica Instrumentalis - in this case improvisations, on the new Brantwood Musical Stones, played by percussionist Dame Evelyn Glennie). Figure 3: Rock detail in the lithophone exhibition at Brantwood using text by John Ruskin. Carving by Lida Lopez Kindersley Cardozo. Figure 4: Chion’s modes of listening intersecting. In previous pieces I have interwoven these different discourses in a linear and sometimes semi-narrative structure through sound transformation techniques where a sound may morph from the recognisable to the abstract. In my 2002 work Joyce’s Vision , for example, a single recording of the voice speaking text from James Joyce’s Ulysses is transformed in a number of ways, alluding to both real-world sounds that the text describes as well as more abstract interpretations. In the example below, the word ‘waves’ is transformed into sounds mimicking waves crashing on the seashore. • Causal: Man speaking transforms into waves crashing on the shore. • Semantic: The word ‘wave’ transforms into the physical manifestation of what it describes. • Reduced: Sibilance of ‘s’ transforms into a thick, polyphonic, noise-based texture. In Living Waves, however, the blurring of boundaries is more layered and collage-like. Intelligibility of spoken word is maintained, and soundscapes are presented unaltered in a subtle underscore. Transformation techniques have mainly been reserved for the lithophone related material (both the played stones and the cutting processes used to make the keys). I have tried to arrange gradually shifting layers which move from the microscopic to the panoramic, as well as representing Musica Mudana, Musica Humana and Musica Instrumentalis. The microscopic is represented through the processed lithophone material which has undergone various granular synthesis techniques. In this case I have intended the grains of sound to represent the tiny grains in the rock as one might see them under the microscope, where the fold structures are still preserved. This refers directly to Ruskin’s text where he says ‘…this rock trembles through its every fibre…’  I imagine these frozen oscillations to represent the smallest waves in the structure. Moving up a level of scale, we hear the lithophone being played by Dame Evelyn Glennie. This improvised material also has a wave-like quality, being built up from rolling ostinatos which ebb and flow in dynamic and pitch. The previously heard granular material is actually made up from this improvisation, forming a precursor to this section, giving the impression of being zoomed in on the rock, and then shifting perspective in the next section. Finally, moving out in perspective again, the overall structure of the piece is shaped like a wave, gradually building in energy until the final climax and dissipation at the end. This is meant to represent the panoramic level of scale, where the waves are now the size of mountains. The soundscape recordings are integrated as a subtle word-painting accompaniment to the text. I have attempted to create a blurring between these and the granular textures of the processed lithophone material as well as the sounds of water-jet cutting which have been processed to become more fluid. The most successful presentation of the work to date was at Scarborough’s Rotunda Museum (created by father of modern Geology, William Smith), as part of Coastival 2014, where it was presented as an installation, playing on a loop, therefore creating a more non-teleological structure. This created a sense of cyclical wave structure to the piece and felt more fitting to the concept of repeated waves at different levels of scale. It also helped to represent the vastness of geological time and the sense of on-going natural processes. The round cross-section of the Rotunda fitted perfectly with the surround-sound nature of the piece, and again alludes to the sense of a cyclical pattern rather than a linear one. Figure 5: Living Waves performed as an installation at the Rotunda Museum, Scarborough, as part of Coastival 2014. Photos by Tariq Emam and Scarborough Museums Trust. Sound transformation and spatialisation techniques are employed to mimic some of the patterns occurring in the sound paintings, as well as helping to create the illusion of shifting perspective from the microscopic to the panoramic. Much of the sound design was achieved through the use of BAT  (Bangor Audio Toolkit), a series of Max patches created by Prof. Andrew Lewis at the University of Bangor. These allow for multichannel work with granular synthesis, including BATBoids  which uses an implementation of Craig Reynolds’ Boids algorithm (mimicking the flocking and swarming of birds, bees, fish etc). I used this to impose a flocking spatialisation onto the sound of water-jet cutting. This creates the effect of shoaling fish as well as an allusion to fluid, wavelike movements. Close collaboration with the performer during the recording of improvised material on the instruments ensured there were opportunities for transformation and mimicry between the instrumental and soundscape material. Figure 6: Dame Evelyn Glennie playing at the Ruskin Rocks launch at Brantwood in August 2010. Once the Brantwood Musical Stones had been created, it was decided to make reference recordings of each key on the larger instrument in situ for possible use in the compositional process for Living Wavesand for future installation work. Both lithophones are housed in the Linton Room, which is part of the Brantwood Estate. The larger instrument is comprised of 4 octaves. Each octave is made from a different rock type (C1 – B1: Slate from High Fell Quarry; C2 – B2: Shap Blue from Shap Quarry; C3 – B3: Hornfels from Skiddaw; C4 – C5: Limestone from Stainton Quarry). Figure 7: Large lithophone housed in the Linton Room at Brantwood. Each rock type has its own unique timbre which was captured via close mic’ing with a Neumann KM-140 microphone. Each key was recorded at different dynamics and with different hardnesses of beater. In total, 279 samples were chosen to create two virtual lithophones in Native Instruments Kontakt 2. One virtual instrument is played with a hard beater, the other with a soft beater. This allowed for further versatility in the compositional process of Living Waves as well as future work. Sound Example 3: Large lithophone played with hard beater. Sample contains C1, C2, C3, C4 and C5, each played at three different dynamics (best played over full-range loudspeakers or headphones). Sound Example 4: Large lithophone played with soft beater. Sample contains C1, C2, C3, C4 and C5, each played at three different dynamics (best played over full-range loudspeakers or headphones). Movie Example 1: Demo of Strata showing Synapse mapping (bottom left) and the installation’s visual display. The lithophone samples are all derived from direct recordings and are untreated (audio best monitored over full-range loudspeakers or headphones). Further interaction with the space is produced by head tracking which controls a quad panner, allowing the user to diffuse the sound as they move through the space. Figure 8: Simplified floor layout of Strata. In-line with budget constraints and practical considerations, a domestic 5.1 DVD playback system was chosen for the sound playback. This provided enough channels for an immersive sound experience within the installation space, as well as a reliable and easy to use playback system. Figure 9: Scarborough’s Lost Dinosaurs Exhibition at the Rotunda Museum, Scarborough. All artwork by Robert Nicholls (Paleocreations). Photo by Tony Bartholomew, courtesy of Scarborough Museum’s Trust. Based on geological evidence, a mural of a Jurassic scene was constructed by palaeo-artist Robert Nicholls of Paleocreations. This was wrapped around the installation space. The soundscape was constructed to reflect the visual representation, with the sound of running water set off to the west. The presence of herbivorous dinosaurs has been inferred by the sounds of breaking branches, and brushing of leaves, caused by grazing movements. No attempts at recreating vocalisations were made since there is not enough scientific evidence to be able to do so, and any attempts would only be based on conjecture at best. Figure 10: Detail from large mural created for Scarborough’s Lost Dinosaurs Exhibition. All artwork by Robert Nicholls (Paleocreations). Photo by Tony Bartholomew, courtesy of Scarborough Museum’s Trust. Growing from the Ruskin Rocks Project, an on-line soundmap  is being constructed which combines field recordings from relevant locations in Cumbria alongside studio recordings of the lithophones created for the project. The concept is to develop two layers of map: 1) displaying the topography above the ground (integrating the field recordings of the soundscapes); 2) displaying the geological rock formations below the ground (integrating the lithophone recordings of the different rock types so that the varying timbres of the different rock types can be experienced). This is being implemented using Google Maps. In addition, Google Earth, Audioboo, and Geological Maps from Digimap on-line are also being considered for future developments. (By Martin and Jean Norgate (2012). Geography Department, Portsmouth University). Following on from the presentation of Strata, alongside Mapping  (an installation by Sam Eaton), a newer installation, Sounds of Our Surroundings , was created for Coastival 2014 (a collaboration between Mackay and Eaton). This takes the concept of the above soundmap and presents it in a 3D audio-visual environment where the participant can navigate a virtual map of a local area and play the sounds of their environment like a musical instrument (using sounds from both above and below the ground). Figure 12: 3D representation of Sounds of our Surroundings installation set-up (produced by Sam Eaton). Further work with poetry and the environment has taken place in the project Resounding Mulgrave , which was part of the Arts Council England funded Dictionary of Stone, curated by Lara Goodband. This brought three artist interventions into the Rotunda Museum to interpret the geological landscape of its surrounding area and saw me collaborate with poet John Wedgwood Clarke on a section of the North Yorkshire Coast between Port Mulgrave and Staithes, which is rich in both geological and human history. Video footage captured by Tariq Emam, Clarke and Mackay, of improvisations in the landscape as well as an 8-channel sound piece weaving field recordings, site improvisations and site readings of poetry were presented at the Rotunda Museum from 6th June – 14thJuly 2014. Figure 13: Will Watts (Former Head of Public Programmes – Scarborough Museums Trust, now Director at Hidden Horizons) next to exhibited plesiosaur at the Rotunda Museum (photograph by Tony Bartholemew). The collaboration with the Rotunda Museum has led to the potential commission of a 3D underwater soundscape for a proposed exhibition at the Rotunda featuring a unique 70 million year old plesiosaur skeleton. This is believed to form a missing link in plesiosaur evolution. As part of the Sounds of Our Surroundings working group of the ICP Cluster at the University of Hull , experiments in underwater ambisonic hydrophone arrays are being conducted in order to recreate 3D underwater soundscapes. Further off-shoots of this line of enquiry may form investigations into the resonant frequencies of fossilised otoliths (inner ear-bones of fish) in order to ascertain more information about palaeo-environments and ecosystems. The projects have been made possible through the support of a number of organisations: Natural England (through DEFRA’s Aggregate Levy Fund); Arts Council England; University of Leeds; University of Hull; Create; and Scarborough Museums Trust. Personal acknowledgements go to Bobbie Millar for the Living Waves commission as well as everyone on the Ruskin Rocks project for inspiration and guidance; Kia Ng and Marcus de Mowbray for insights into the Lithophone creation; Martin Seddon for advice on recording techniques and for providing some of the soundscape recordings; Lara Goodband for the Resounding Mulgrave commission; and Dame Evelyn Glennie for her inspirational playing and musical insights. http://www.leeds.ac.uk/ruskinrocks/, Project lead: Prof Bruce Yardley, Dept. of Earth Sciences, University of Leeds. Coordinator: Bobbie Millar. Designed by Dr Kia Ng (University of Leeds) and Marcus de Mowbrey (freelance musical instrument maker). Mackay, R., “Song of Stones”, In Concours Luc Ferrari – 7e Concours International D’Art Radiophonique pour Sons Fixes et Voix, La Muse en Circuit, 2007. Compact disc. [MUSE7/1]. Ruskin, J. (2009) Deucalion, D.D.Merrell, 1886, Re-produced by BiblioBazaar. Adkins, M. (2007) ‘The Influence of Futurist Painting Techniques in my Music’, in Proceedings of Digital Music Research Network Summer Conference, Leeds Metropolitan University. Chion, M. (1994) Audio-Vision: Sound on Screen. Columbia University Press. Emmerson, S. (Ed) (1986) The Language of Electroacoustic Music, Palgrave Macmillan. Ruskin, J. (2000) Modern Painters IV, 1860, Re-Produced by Adamant Media Corporation. Lewis, A. (2007) ’BATBoids’ v1.00, Bangor University (Wales). Gu, J., Montealegre-Z, F., Robert, D., Engel, M.S., Qiao, G., and Ren, D. (2012) ‘Wing stridulation in a Jurassic katydid (Insecta, Orthoptera) produced low-pitched musical calls to attract females’, in Proceedings of the National Academy of the United States of America, March 6, 2012, Vol. 109, no. 10. Robert Mackay is a composer, performer, installation artist and lecturer at the University of Hull. Having started his career as an acousmatic composer, Mackay’s recent work uses new technologies to create unique interactive sound environments. His paper discusses his recent Strata Sequence which includes multi-channel compositions using a specially built lithophone (the Brantwood Musical Stones) played by Dame Evelyn Glennie, an interactive installation allowing participants to play a virtual version of this lithophone and a Jurassic soundscape entitled Re- imagining the Jurassic.